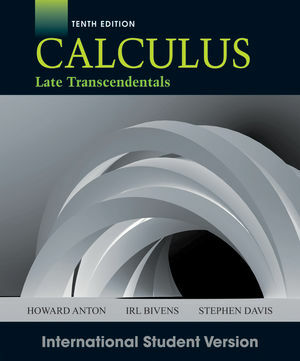 Calculus: Late Transcendentals, Tenth Edition continues to evolve to fulfill the needs of a changing market by providing flexible solutions to teaching and learning needs of all kinds. Calculus: Late Transcendentals, Tenth Edition excels in increasing student comprehension and conceptual understanding of the mathematics. The new edition retains the strengths of earlier editions: e.g., Anton's trademark clarity of exposition; sound mathematics; excellent exercises and examples; and appropriate level, while incorporating more skill and drill problems within WileyPLUS. The seamless integration of Howard Anton’s Calculus: Late Transcendentals, Tenth Edition with WileyPLUS, a research-based, online environment for effective teaching and learning, continues Anton’s vision of building student confidence in mathematics because it takes the guesswork out of studying by providing them with a clear roadmap: what to do, how to do it, and if they did it right. Available for download at www.wiley.com/go/global/anton and in WileyPLUS. • Exercise sets have been modified to correspond more closely to questions in WileyPLUS. In addition, more WileyPLUS questions now correspond to specific exercises in the text. • New applied exercises have been added to the book and existing applied exercises have been updated. • There will be more rich content, including assignable questions as well as new applets for visualization and exploration, in the WileyPLUS environment. • Readability Balanced with Rigor: The authors' goal is to present precise mathematics to the fullest extent possible in an introductory treatment. • Commitment to Student Success: Clear writing, effective pedagogy--including special exercises designed for self-assessment--and visual representations of the mathematics help students from a variety of backgrounds to learn. Recognizing variations in learning styles, the authors take a "rule of four" approach, presenting concepts from the verbal, algebraic, visual, and numerical points of view to foster deeper understanding whenever appropriate. • Dependability: Anton provides thorough topic coverage organized to fit standard curricula and carefully constructed exercise sets that users of previous editions have come to depend upon. • Flexibility: This edition is designed to serve a broad spectrum of calculus philosophies-from traditional to "reform." Technology can be emphasized or not, and the order of many topics can be adapted to accommodate each instructor's specific needs. • Quick Check Exercises: Each exercise set begins with approximately five exercises (answers included) that are designed to provide the student with an immediate assessment of whether he or she has mastered key ideas from the section. They require a minimum of computation and can usually be answered by filling in the blanks. • Focus on Concepts Exercises: Each exercise set contains a clearly identified group of problems that focus on the main ideas of the section. • Technology Exercises: Most sections include exercises that are designed to be solved using either a graphing calculator or a computer algebra system such as Mathematica, Maple, or Derive. These exercises are marked with an icon for easy identification. • Expository Excellence: Clear explanations allow students to build confidence and provide flexibility for the instructor to use class time for problem solving, applications and explanation of difficult concepts. • Mathematical Level: The book is written at a mathematical level that is suitable for students planning on careers in engineering or science. • Applicability of Calculus: One of the primary goals of this text is to link calculus to the real world and the student s own experience. This theme is carried through in the examples and exercises. • Historical Notes: The biographies and historical notes have been a hallmark of this text from its first edition and have been maintained in this edition. All of the biographical materials have been distilled from standard sources with the goal of capturing the personalities of the great mathematicians and bringing them to life for the student.